Michael Phillips is an investment advisor representative for Verus Capital Partners, LLC and Certified Financial Planner™ for Phillips Financial Management since 2010. Michael graduated from Arizona State University's W.P. Carey School of Business with a bachelor's degree in Global Business with an emphasis in Finance. Michael earned his CFP® designation in 2012 and also holds series 7 and series 66 securities registrations. In addition, Michael is registered with the state of Arizona to offer both life and health insurance. Being honest, transparent and hardworking are traits that Michael takes great pride in. 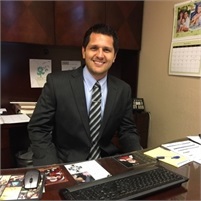 Michael assists families and businesses in creating and executing a custom tailored financial plan that fits personal and specific goals. Michael believes that educating clients and giving thorough analysis is the key for clients to understand and believe in those specific goals. Michael is married to his beautiful wife Michelle and has three beautiful daughters, Millie, Vera and Ruth. Away from business Michael enjoys traveling, playing golf and spending time with family and friends.